Broadway's My Beat, a radio crime drama, ran on CBS from February 27, 1949 to August 1, 1954. With music by Robert Stringer, the show originated from New York during its first three months on the air, with Anthony Ross portraying Times Square Detective Danny Clover. John Dietz directed for producer Lester Gottlieb. Beginning with the July 7, 1949 episode, the series was broadcast from Hollywood with producer Elliott Lewis directing a new cast in scripts by Morton Fine and David Friedkin. The opening theme of "I'll Take Manhattan" introduced Detective Danny Clover (played by Larry Thor), a hardened New York City cop who worked homicide "from Times Square to Columbus Circle -- the gaudiest, the most violent, the lonesomest mile in the world." Danny Clover narrated the tales of the Great White Way to the accompaniment of music by Wilbur Hatch and Alexander Courage, and the recreation of Manhattan's aural tapestry required the talents of three sound effects technicians (David Light, Ralph Cummings, Ross Murray). Bill Anders was the show's announcer. 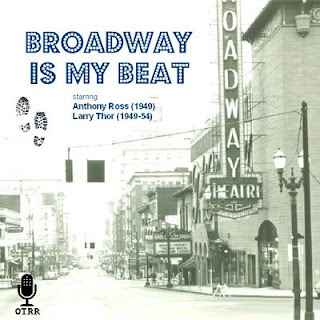 Broadway Is My Beat is a radio crime drama that ran on CBS from February 27, 1949 to August 1, 1954. The show originated from New York during its first three months on the air, with Anthony Ross portraying Times Square Detective Danny Clover. Beginning with the July 7, 1949 episode, the series was broadcast from Hollywood with producer Elliott Lewis directing a new cast in scripts by Morton Fine and David Friedkin. Now from the excellent scripts written by David Friedkin and Morton Fine, the radio show has been adapted to video by Gregory Friedkin, a television professional and son of the original author. The show is filmed in California and renamed The Boulevard. The audition show is based on the radio script "The Marsha Dean Murder Case" that was broadcast on 5/12/1950. Set in 1953 Los Angeles, Police Detective Danny Clover investigates a kidnapping that quickly turns fatal. Clover cracks cases the old fashioned way; pounding pavement, knocking on doors, trusting his keen intuition. Fine characterizations for a cops series. Larry Thor is Danny Clover and the show is on a par with, maybe even better than, Dragnet. Anyone who has lived in New York City can easily identify with the Broadway Clover describes, at least before it was turned into today's glitz and glitter. Thoroughly enjoy this program and appreciate OTRR for compiling and offering it.